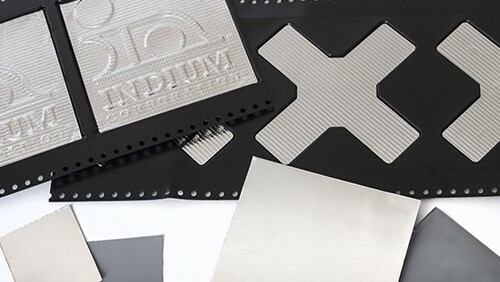 Indium Corporation will feature its metal thermal interface materials for burn-in and test, including HSK patterned Heat-Spring®and HSMF-OS, at TestConX on March 3-6 in Mesa, Ariz.
A pure indium Heat-Spring®in the HSK pattern can be clad on one side with a thin layer of aluminum, which will prevent the indium from sticking to the device under test (DUT). Due to the thinness of the aluminum, it has minimal impact on the thermal conductivity of the indium. HSMF-OS has a multi-layer construction with a total thickness of 0.004” that is designed for multiple insertions. It has an aluminum layer that acts as an interface with the DUT and has a tensile strength of approximately 90 MPa with a soft, compliant polymer backing. This unique construction results in a configuration with “designed-in” insertion survivability.